Dioscorus of Aphrodito was the last poet of antiquity. Most likely, he was also involved in business with a monastery; this we can learn from a letter from the 6th century. The largest collection in the Nordic region of papyrus fragments from ancient Egypt is located in a room with glass walls on the third floor of the University Library at Blindern campus in Oslo, Norway. The letter that provides new knowledge about the last poet of antiquity is one of several, as yet unpublished, papyrus texts from the Oslo collection. “On initial reading this appeared to be a fairly ordinary letter from Byzantium, written some time during the 6th century CE. One never quite knows what one may find when starting to decipher such a text,” Anastasia Maravela says. She is professor of Ancient Greek and heads the team studying the papyrus fragments at the University of Oslo (UiO). “Most of the fragments are in Greek, which was the dominant language of culture and administration in Egypt at that time. Deciphering Greek cursive handwriting is not easy, especially when such mundane documents as this one are involved,” the papyrologist Maravela points out. “Often, just a single word will set you on the right track,” says Joanne Vera Stolk, one of the PhD students in the research team. It was she who deciphered the fragment with inventory number 523, and was thus the first to discover that this apparently mundane letter provides us with new and significant knowledge about Flavius Dioscorus of Aphrodito, the last poet of antiquity. Maravela says that the fragment has two sides. On the front is the letter, and on the back somebody has noted a list of expenses. The letter proves to describe cultivated land that had yielded less return than expected. In the first line of the letter, the name Apa Souros turns up. And this is interesting, because the monastery consecrated to Apa Souros thus proves to have a link to Dioscorus, Stolk says. The land described in the letter belonged to the monastery, but was leased to someone else, possibly Dioscorus. The PhD student has also found the name of the person who wrote the letter: Ammonios. On the back of the fragment the poet Dioscorus, who was also a lawyer, has made a list of sums of money that he owed to people. He referred to it as a “list of various expenses”. At the very end of the list he has also made a note of some clothes he has ordered for Sophia, his wife, Stolk explains. The papyrus fragment with the letter and the list on the back is an important contribution to the research on Dioscorus. Its most valuable aspect is the connection between the three: the Souros monastery, Dioscorus and Ammonios. Various documents on all these exist, but the business connection between them is a new discovery. “The fact that Dioscorus most likely maintained contact with the Souros monastery at a business level has not previously been documented by other sources,” Maravela points out. 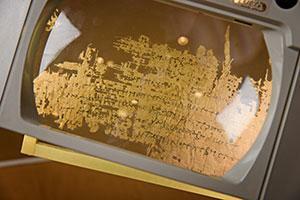 The papyrus fragment joins a large group of texts that document the life and work of Dioscorus in detail. The handwritten poems of the last poet of antiquity, written on papyrus, were discovered in a jar in 1905, and are currently located in libraries and museums around the world. The collaborators with the research team at UiO include Jean-Luc Fournet, a specialist on Dioscorus at Paris-Sorbonne University. Like many other papyrus fragments, the letter also provides us with new knowledge about Christianity as a historical phenomenon. “It tells us, for example, that the monasteries were not exclusively spiritual institutions, but that they were also deeply involved in secular life, in this case agriculture,” Maravela explains. Much of our knowledge on Dioscorus and his life and work he has provided himself. The last poet of antiquity did in fact write poetry about his contemporary time. Papyrus was used all over the Mediterranean region, but it is only in Egypt that the papyrus scrolls have survived without disintegrating, because the dry desert wind hamsin helped cover them in completely dry sand. The papyrus texts bring us as close as we can come to the people who lived in antiquity. The research team at UiO will publish a total of two volumes with annotated versions of fragments from the Oslo collection. Not only will the texts be translated and provided with annotations that explain and comment on their language and content, the texts will also be placed in their proper historical, linguistic and cultural context. “Many enigmas and previously undiscovered things are found here. Some of our latest findings include two fragments that proved to be connected. One of them documents a visit by Emperor Septimius Severus to Egypt. It’s a judicial decision sent from Syria, and it’s provided with a date. We know that the emperor visited Egypt in the years 199 and 200 CE, and stayed in Syria for two years after that,” Maravela tells us. Another important fragment has turned out to be a Christian letter of recommendation from the late 2nd or early 3rd century. It refers to a young boy and another person, probably the boy’s father. The boy is characterized as a believer and his father as “under catechesis”. The letter has been signed by a large number of persons who most likely are officials and members of a Christian congregation. “The letter documents the spread of Christianity in Egypt in a unique manner,” Maravela states.